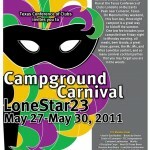 Lonestar 23 – Join US! 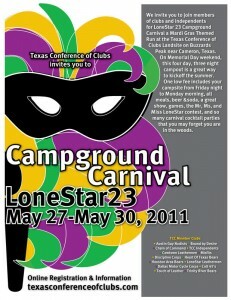 There were a good number of HOT Bears at Texas Conference of Clubs over Memorial Day weekend at the annual Lone Star campout. We joined clubs from around the state for a “Survior Theme” 3 day event. Despite the hot weather, we had a great time with games, great food, cocktail parties, the Mr, Ms, and Miss LonsStar contest and a show. Austin’s own “Miss Tippy” (aka “Boy Joe”) performed a great number on Saturday night. The HOT Bears had their cocktail party on Sunday. Given by the pool, we had bubble machines, and umbrellas in the tropical whiskey sour drinks. The four people helping (Rob, James, Eric, and I) all wore grass skirts and combat boots with little else. The party was a smash hit and extended the HOT Bear camaraderie way beyond the 60 minutes allotted in the schedule. There was also a raffle. The HOT Bears offered a basket, won by “Serenity” the new Ms LoneStar. We also offered a run pass to Back To The Woods 6 – won by Conrad Fertilla. He was very excited about it – said that Back to the Woods is his favorite run of the year. We look forward to having him, his partner and you at B2W6 in October (applications now online at heartoftexasbears.org/bttw). LoneStar22: HOT Bear cockails served poolside by (left to right) Rob, James, Peter, and Eric. We all had a great time at this annual event at Texas Conference of Clubs- and sure look forward to Back to the Woods 6 and other TCC weekends throughout the year. Want to go? Email me for details -- Peter.